FortiSwitch Data Center switches deliver outstanding throughput, resiliency and scalability for organizations with high performance data center network requirements. They are ideal for Top of Rack server or firewall aggregation applications, as well as enterprise network core or edge deployments, where high performance 10 GE and 40 GE is required. Purpose-built to meet needs of today's bandwidth intensive data centers and enterprise networks, FortiSwitch Data Center Switches deliver highperformance with a low Total Cost of Ownership. Reduces complexity and decreases management cost with network security functions managed through a single console via FortiGate. This integration allows all users to be authenticated against the same user database, regardless of whether they connect to the wired or wireless network, including temporary guest users. In addition, same security policy can apply to a user or device regardless of how or where they connect to the network. Future-proofed 10 GE to satisfy the bandwidth requirements of intensive data center and network core applications and maximizes network availability with dual power supplies. High capacity switch suitable for Top of Rack or enterprise network deployments. Maximum availability through dual hot swappable power supplies. Simply management via a web-based or command line interface. Switch security features protect vulnerable infrastructure without adding latency. 1 GE or 10 GE access ports, in a compact 1 RU form factor. 40 GE capability on the FortiSwitch-1048D. 10 GE Capability Future-proofed 10 GE to satisfy the bandwidth requirements of intensive data center and network core applications. Dual Power Supply Units Maximizes network availability by eliminating the downtime associated with single power supplies. Web and CLI Management Configuration and visibility into the network is made simple via a web-based interface or CLI. IGMP Snooping (v1/v2/v3) Please refer to the Release Notes. * Tested with Solarwinds NPM tool. Please refer to FortiSwitch Admin Guide for details on setup. The FortiSwitch Secure Access Switch series integrates directly into the FortiGate* Connected UTM, with switch administration and access port security managed from the familiar FortiGate interface. Regardless of how users and devices connect to the network, you have complete visibility and control over your network security and access through this single pane of glass, perfectly suited to threatconscious organizations of any size. Virtualization and cloud computing have created dense high-bandwidth Ethernet networking requirements in the data center, pushing the limits of existing data center switching. FortiSwitch Data Center switches meet these challenges by providing a high performance 10 or 40 GE capable switching platform, with a low Total Cost of Ownership. Ideal for Top of Rack server or firewall aggregation applications, as well as enterprise network core or distribution deployments, these switches are purpose-built to meet the needs of today's bandwidth intensive environments. 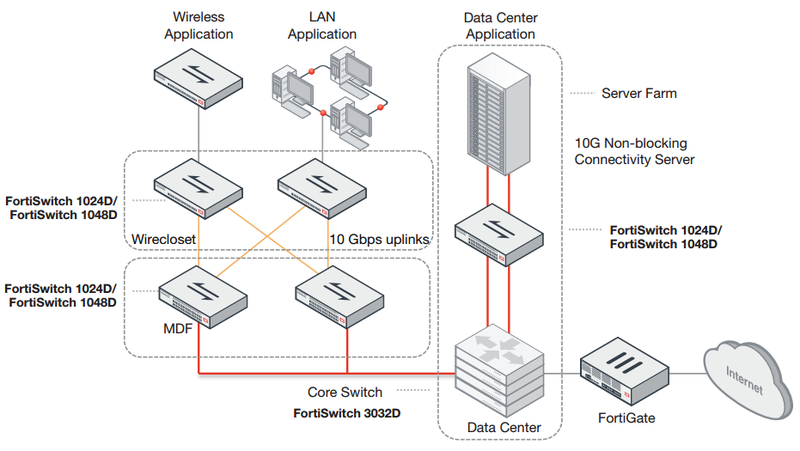 Download the Fortinet FortiSwitch Data Center Series Datasheet (PDF). 10GE copper SFP+ RJ45 Transceiver (30m range) for FortiSwitch with SFP+ slots.